Hide this Project (Eisha Erica) Discover properties in other projects by hiding the ones that doesn't interest you. You won't see them in your searches further but you can unhide anytime later. Hide this Dealer (vikram deshmukh) Discover properties by other dealers by hiding those whom you have already spoken to. You won't see them in your searches further but you can unhide anytime later. Hide this Dealer (Rashmi Kulkarni) Discover properties by other dealers by hiding those whom you have already spoken to. You won't see them in your searches further but you can unhide anytime later. Hide this Dealer (Paresh G Awashank) Discover properties by other dealers by hiding those whom you have already spoken to. You won't see them in your searches further but you can unhide anytime later. Hide this Dealer (Sachin Bairagi) Discover properties by other dealers by hiding those whom you have already spoken to. You won't see them in your searches further but you can unhide anytime later. Hide this Dealer (Shilpa Kulkarni) Discover properties by other dealers by hiding those whom you have already spoken to. You won't see them in your searches further but you can unhide anytime later. Hide this Dealer (NAVIN) Discover properties by other dealers by hiding those whom you have already spoken to. You won't see them in your searches further but you can unhide anytime later. Hide this Dealer (Swapnil Hamdapure) Discover properties by other dealers by hiding those whom you have already spoken to. You won't see them in your searches further but you can unhide anytime later. Hide this Dealer (Elegance Properties)Discover properties by other dealers by hiding those whom you have already spoken to. You won't see them in your searches further but you can unhide anytime later. Eisha Erica, located in Pune, is a residential development of Eisha Group. It offers spacious and skillfully designed 1BHK and 2BHK apartments. The project is well equipped with all the basic amenities to facilitate the needs of the residents. The site is in close proximity to various civic utilities. Dhayari is located close to the Khadakwasla Lake in Pune. Easy accessibility to almost all areas of the city and extremely well planned infrastructure is making this place a favorite among all residential and commercial developers. Dhayari is the latest choice of the young homebuyers of India. Also, named among the most desirable cities in India, the realty market of Pune has plans to further expand its fleet of construction projects and give space to some more residential and industrial projects. In which area is Eisha Erica located?The project is situated in Dhayari, Pune. What apartment sizes are available in Eisha Erica? The project offers apartments sized between 349.0 sqft and 651.0 sqft. 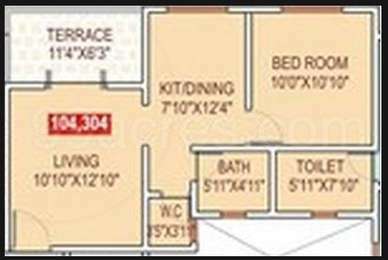 What is the area of 1 bhk in Eisha Erica? 1 BHK units in the project are available in a size of 349.0 sqft to 395.0 sqft. What is the 2 bedroom size in Eisha Erica? 2 BHK units in the project are available in a size of 542.0 sqft to 651.0 sqft. What is the total area of Eisha Erica?The project spans across 0.65 Acres. What is total price of 1 bhk in Eisha Erica? 1 BHK units in the project are available at a price tag of Rs. 3200000 to Rs. 3300000. With an array of buildings that are exclusive and each one having a special feature makes each of the constructions by Eisha group a benchmark in itself. The builders have a proven track record of excellence in state-of-art in constructions and architectures. The company ensures that they meet the corporate needs and come up with innovative buildings that meet the growing demands in the realty market of Pune. The USP of the builders is the belief that quality construction and timely delivery are two important points that attract the customers. The developers have certain listed values that make them a step near perfection.